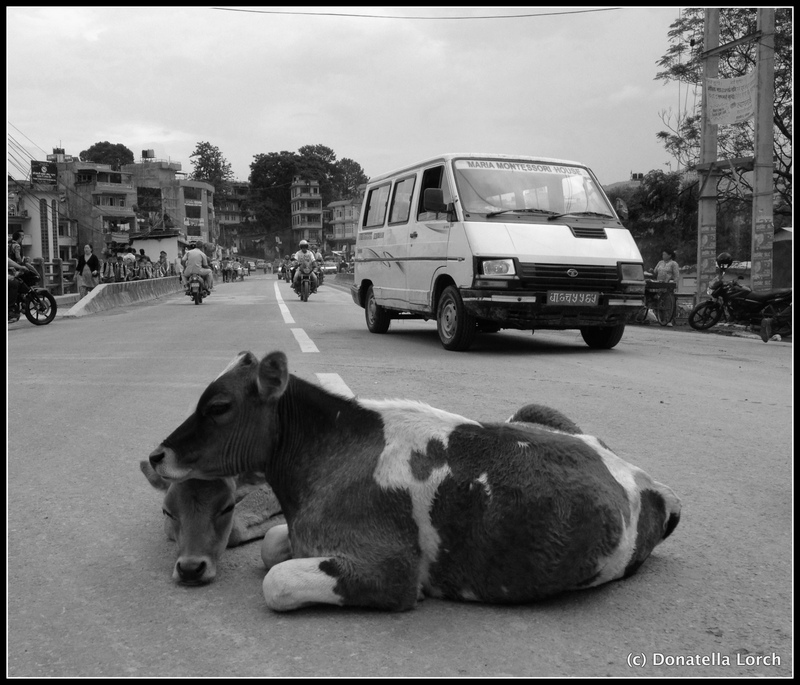 This entry was posted in holy cows, Kathmandu, Nepal, nepal earthquake, stray animals and tagged cows, Donatella Lorch, earthquake, holy cows, Kathmandu, Nepal on July 11, 2015 by Donatella Lorch. 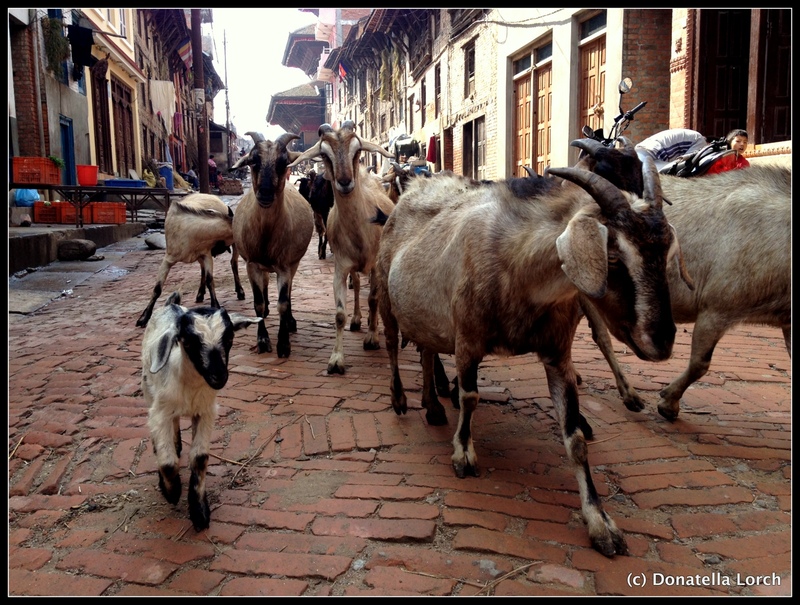 Kathmandu Valley streets are a free range for all animals of all sizes. “Of course I am,” he answered. “What is your favorite dish?” I countered. “But aren’t you a vegetarian?” I sputtered. Since that first encounter with this new definition of vegetarianism, I’ve heard that explanation many times. It is often followed by a discussion on the holiness of cows. Nepal is a secular state, but just over 80 percent of its people are Hindu and it is illegal to kill cows here. 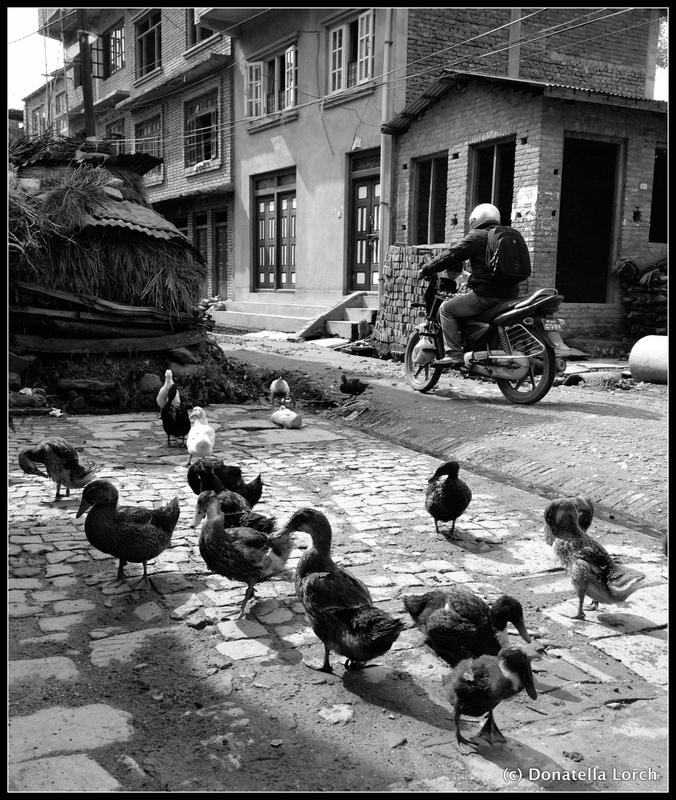 Penalties are similar to those for manslaughter, so be extra careful when you drive around the Kathmandu Valley: city streets are a free range for all animals of all sizes, holy or not. This includes some 20,000 stray dogs as well as goats, ducks, geese, chickens, buffaloes, and many wandering cows – all accompanied by the ubiquitous cacophany of murders of crows that have given the capital one of its nicknames: Crowmandu. I wondered whether my preconception of religious Hindus as complete vegetarians was misplaced, or whether Nepalis aren’t so religious after all? Yet, living in Nepal, I see, hear and smell religion everywhere. Nepalis are believers, of a kind, and even the Maoists and Marxist Leninists seem to have overlooked the Marxist dictum that religion is an opiate of the masses. There are 330 million gods worshipped in this country, where only 10 percent of the people are Buddhist and a tiny percentage Muslim or Christian. At Christmas, my Hindu friend Jyoti, wanting me as a Catholic to feel included in Nepali life, assured me that: “Your God is my God.” With 330 million gods already in the panoply, I had to admit that adding one more didn’t seem to be much of a stretch. Though Buddhist numbers are small, Buddhism remains a cornerstone of Nepali identity. Tourism brochures proudly boast Nepal as the “Birthplace of Lord Buddha. Just this week, the government announced a plan to transform the birthplace, the town of Lumbini, into a “global peace hub,” hopefully giving it a desperately needed facelift. By the way, Buddhists here also love their meat. There is a twist to the “can’t kill a cow” law. In Nepal, it is not illegal to eat a cow and many Tibetans here love their beef. But, given the lack of beef vendors, it comes at a steep price. I buy mine from a lone store that ships it in frozen from Australia. There is of course also an underground black market. Friends often ask me what I like about living in Nepal. Though this is a multi-layered complex question without a straightforward answer, I often say that I am inspired by the way Hinduism and Buddhism are not only integrated in every aspect of daily life but that Nepal appears to be the most religiously tolerant country I have ever visited or inhabited. It is also a place where religion is alive and intimate. Buddhists and Hindus share hundreds of festivals and shrines of all shapes and sizes that are everywhere, from huge Durbar squares declared UNESCO World Heritage sites, to hidden stupas in tiny alleyways, a lingam or a rock in the middle of a paved road (surrounded by railings that oblige cars to go around it) or a towering Buddhist vihara on a hillside. 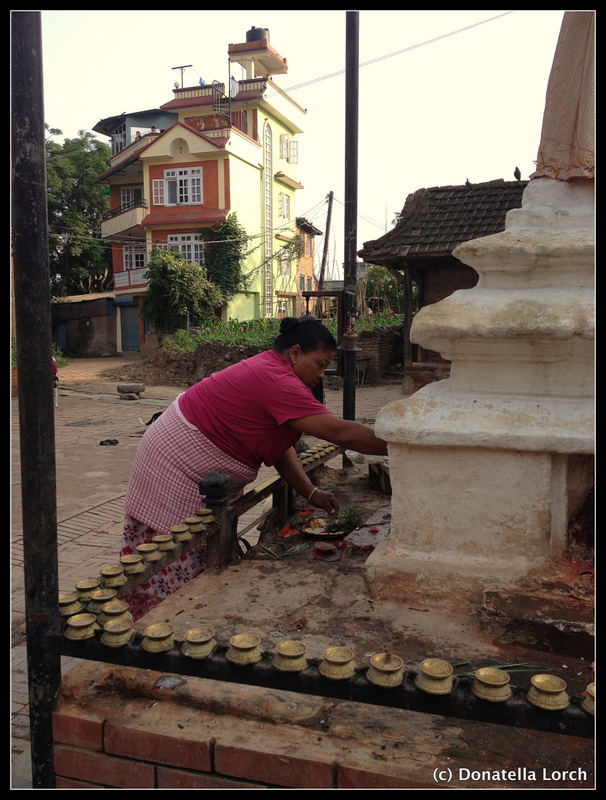 There is not one but several Buddhist ‘Living Goddesses’ that are worshipped by Hindus on a daily basis. These pre-pubescent girls, called Kumari, are allowed out of their homes only on festivals, lathered in makeup and weighed down by jewelry. Their feet are never allowed to touch the ground. Puja, or worship, is constant and everywhere. In the early mornings, the streets are full of women carrying rice, flowers, red thika and food to various neighborhood shrines. 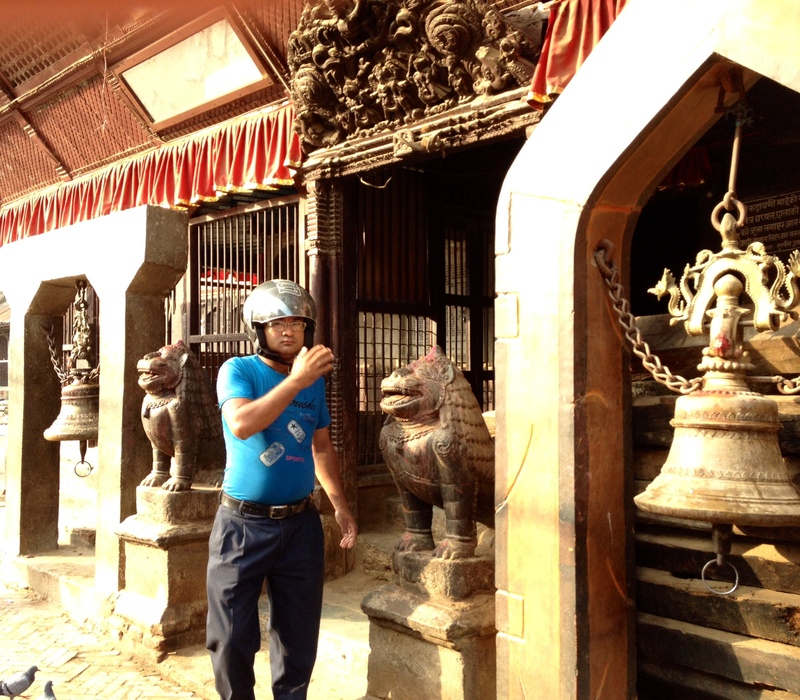 Beware of Kathmandu’s hordes of motorcyclists maneuvering through heavy traffic: many drivers will suddenly bow their heads and lift a hand to their forehead to acknowledge a holy site that is being passed. What, you didn’t spot the holy rock? Apparently, if you are deeply religious, it is also necessary briefly to close your eyes as you drive past. Adds a certain adventure to the driving experience. 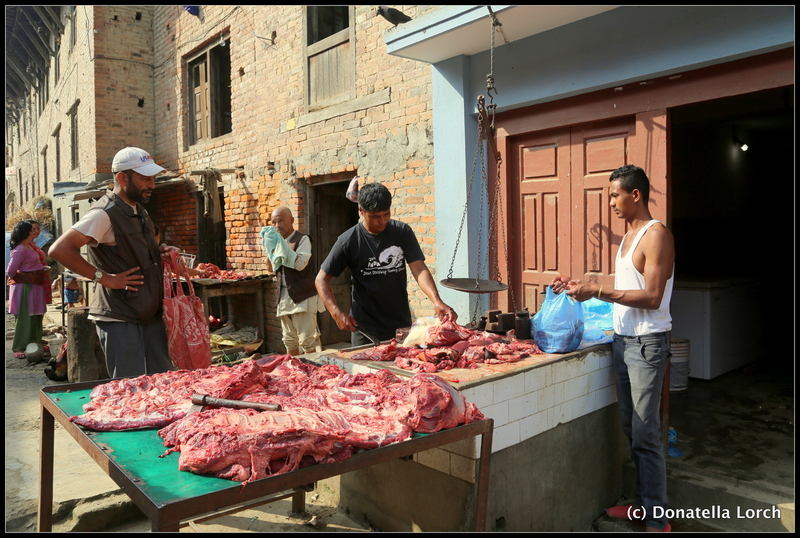 Meat, a major business in Nepal, is an integral part of religious festivals, in particular during the October Dasain Festival, beginning the first day with the army sacrificing buffaloes at a central shrine, and continuing with the family butchering of a goat or, if affordable, a buffalo. Animal sacrifice at temples is practiced year round as well. Even with an outbreak of avian flu that made chicken production fall by 20 percent, the Valley produced over 49,000 tons of meat in the six-month period between mid-July 2013 and mid-January 2014. Buffalo is the most popular meat, taking 45 percent of the market share, with mutton in second place. 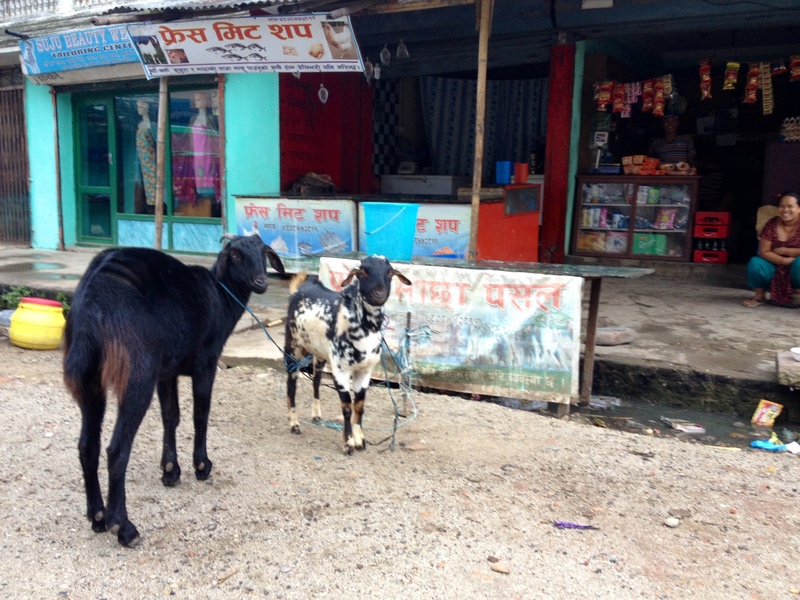 These animals, both dead and alive, are a visible and integral part of Kathmandu life. Many butcher shops are just shacks on the side of the roads, their soon-to-become muttons tethered live on the stoop, whiling away their last few hours chewing on tree branches in uneasy companionship with the stray dogs sitting nearby, patiently waiting for their friends to become food. 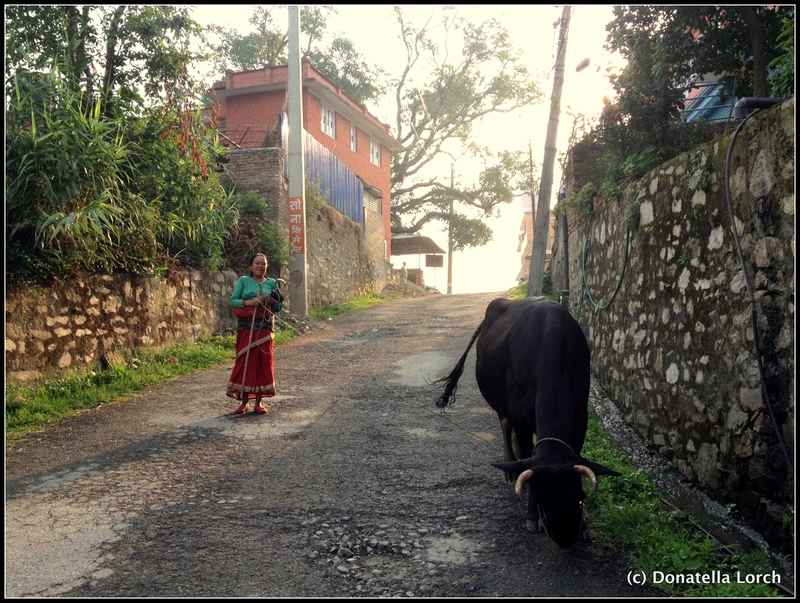 Early every morning in my neighborhood, a bent old man walks half a dozen young buffaloes single-file down the hill and into the courtyard of a red brick house. Within an hour, dripping meat is piled on a wooden table outside in the company of black flies waiting for customers. Even after a year here, I still feel deeply unsettled looking at the goats just feet away from their guillotine. I am also constantly visually reminded that cows are holy, but not their bull calves. Abandoned, the calves try to survive, skinny, listless, parched under the torrid pre-monsoon heat, eating garbage and plastic bags, lazing in the middle of a congested street. It is not only religion that is intimately lived here, but also our relationship with the animals we eat. Even politics gets involved. This week, Hindu right-wingers–wanting to create a Hindu state, ban the sale of beef and declare it a crime for Hindus to convert to another religion–tried to paralyze the capital by declaring a two-day ban on vehicular traffic. Happily, everyone ignored the ban. Another reason I love Nepal. This entry was posted in Buddha, buddhism, hinduism, holy cows, Kathmandu, living overseas, Maoists, Nepal, religion, religious festival, stupa, temple, tourism, World Heritage site and tagged Buddhism, buffalo, carnivores, Donatella Lorch, gods, Hinduism, holy cows, Kathmandu, Kathmandu Valley, living overseas, Nepal, Nepal news, puja, religion, religious festivals, religious tolerance, south asia, tourism, vegetarian, world heritage site, worship on June 27, 2014 by Donatella Lorch.